This guide assumes that you have already installed QuantaStor and have successfully logged into QuantaStor Manager. If you have not yet installed the QuantaStor SDS software on your server, please see the Installation Guide for more details. For a full guide to the web interface see the QuantaStor Administrators Guide. 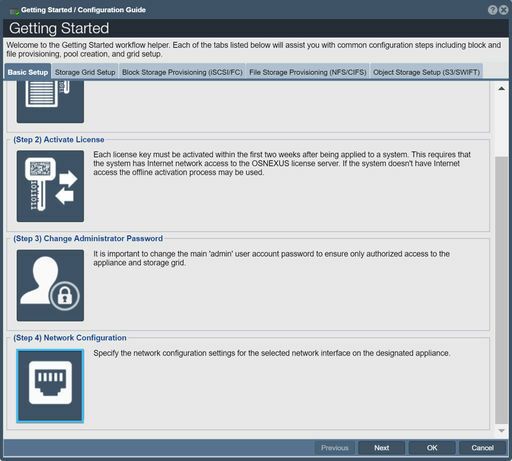 The setup process in the product is currently contained within the Configuration Workflow Manager. The default administrator user name for your storage system is simply 'admin' and this user name will automatically appear in the username field of the login screen. The password for the 'admin' account is initially just 'password' without the quotes. You will want to change this after you first login and it is included in the Workflow Manager. The steps covered here will be necessary to set up your storage system. Once QuantaStor has been installed, the first step is to enter your license key block. Your license key block can be entered using the Add License button in the Workflow Manager or using the License Manager dialog which is accessed by pressing the License Manager button in the toolbar. Note that when you add the key using the 'Add License' dialog you can choose whether or not to include the START/END KEY BLOCK markers, though it makes no difference. For more information on the license, refer to the Storage System License Add page. Once your key block has been entered you'll want to activate your key which can be done in one of two ways. If the new QuantaStor system is connected to the network, the activation can be completed in just a few seconds using the Activate License Online button in the Workflow Manager. The Activate Online button in the License Manager functions the same way. 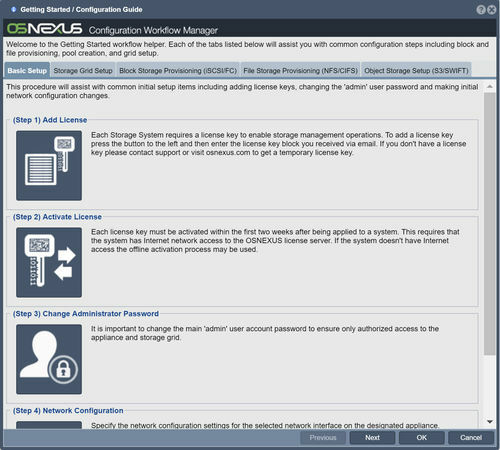 If your storage system is not connected to the internet select the Activate via Email button in the License Manager and send the required information to support@osnexus.com. You have a 7 day grace period for license activation, so you can begin configuring and utilizing the system even if the system is not yet activated. If you do not activate the license within 7 days, the storage system will no longer allow any additional configuration changes until an activation key is supplied. For more information on the license activation, refer to the Storage System License Activate Online page. For security, you will want to create a secure password for your storage system. This can be completed quickly using the Change Admin Password button in the Manager, but also can be achieved via the Set Password button in the toolbar under "Users & Groups". For more information on the password, refer to the User Set Password page. 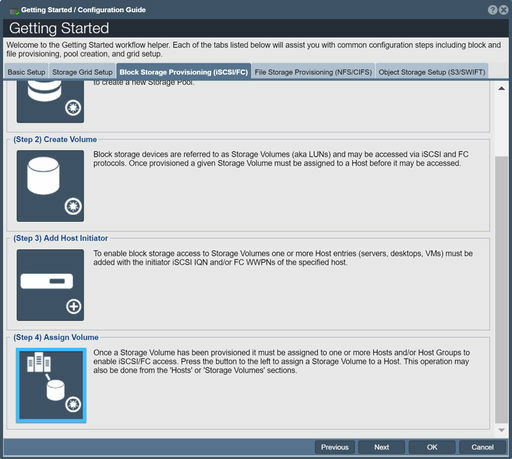 You will want to configure the ports on your storage system. 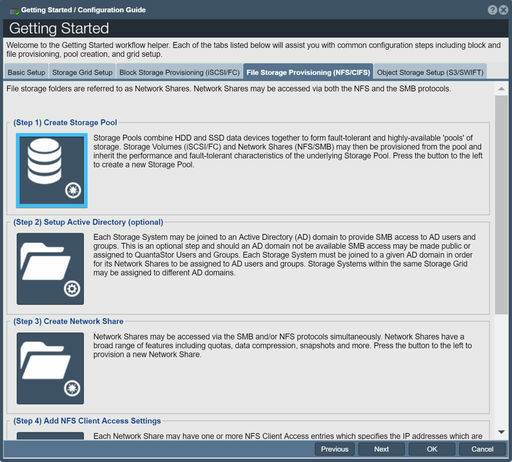 This can be completed quickly using the Network Configuration button in the Manager, but also can be found via right-clicking inside the Network Ports tab, visible when "Storage System" is selected under "Storage Management". For more information on the password, refer to the Network Port Modify page. 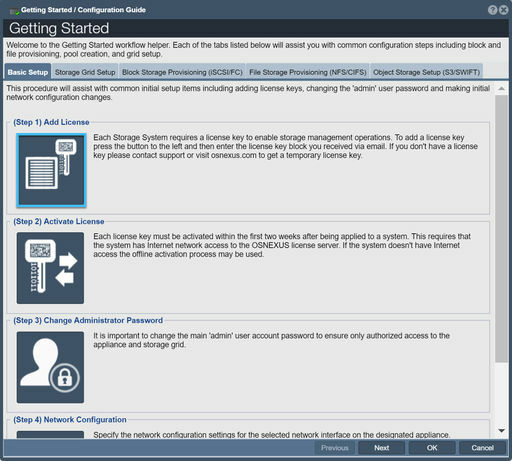 Storage grids, also known as management grids, let you manage multiple storage appliance within the same system. Each appliance can only be part of one management grid. 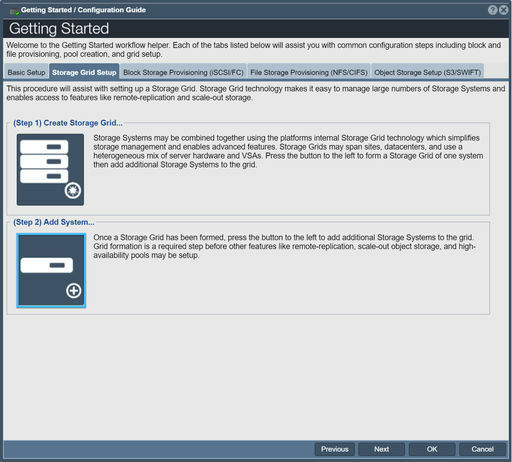 In Workflow Manager, switch to the "Storage Grid Setup" tab and click on the Create Storage Grid button, or rightclick on "Storage System" and select "Create Management Grid". For more information, refer to the Create Management Grid page. Adds other storage systems to your storage grid, called "nodes". 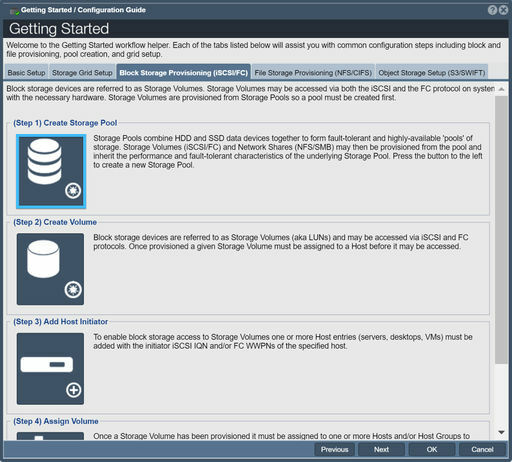 Click on the Add Storage System to Grid button in Workflow Manager, or rightclick on "Storage System" and select "Add Grid Node". For more information, refer to the Add Management Grid page. This step is identical to the one of the same name in the Block Storage Provisioning step. For more information, refer to the Create Storage Pool page. This step works with Microsoft Active Directory to assign network shares to users and groups. Set up Active Directory using the Setup Active Directory button in Workflow Manager, or click on the button Configure Active Directory in the toolbar under "Network Share" in "Storage Management". 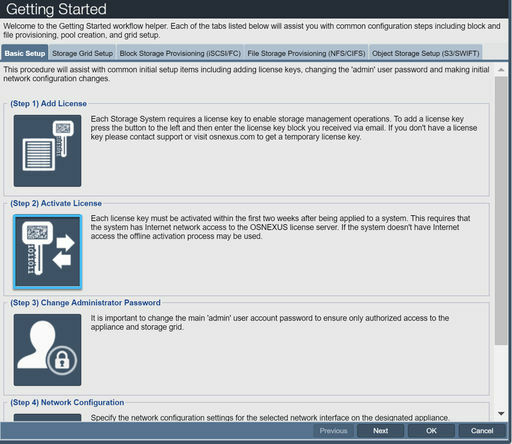 For more information, refer to the Network Share Configure CIFS page. 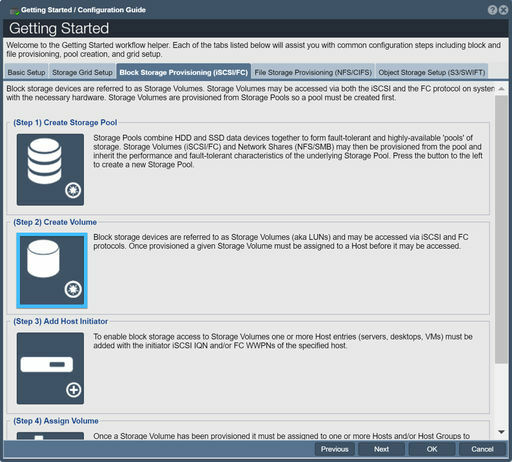 This creates a folder within a selected storage pool. Click on the Create Network Share button in Workflow Manager, or the Create button in "Network Share". 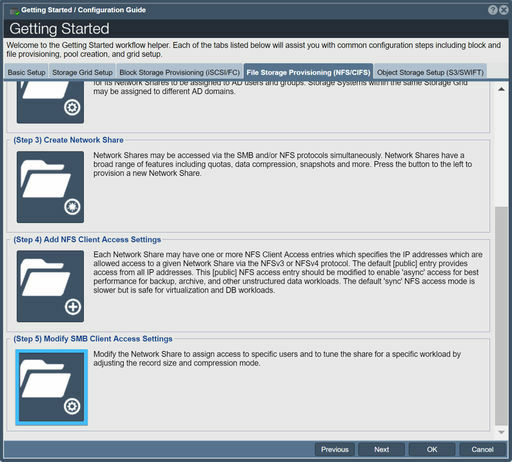 Creates additional client access for the network share. 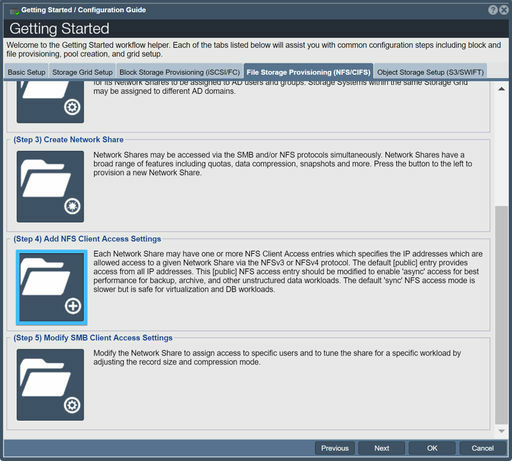 Click on the Add NFS Client Access button in Workflow Manager, or rightclick on the target network share under "Network Share" and click "Add NFS Access". For more information, refer to the Add NFS Client Access page. Lets you control the network share's settings such as compression, quotas, and sync policies. Click on the Modify Network Share button in Workflow Manager, or the Modify button under "Network Share". For more information, refer to the Modify Network Share page. 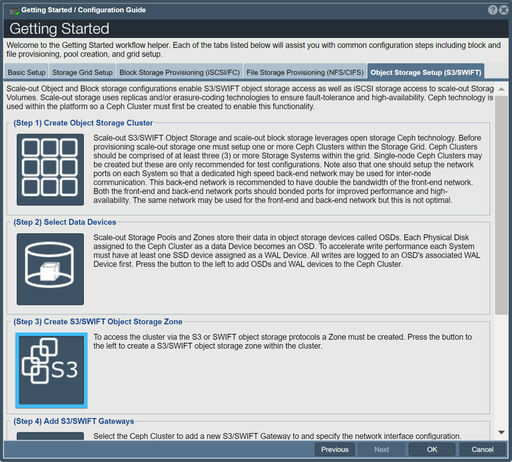 Scale-out S3/SWIFT Object Storage and scale-out block storage leverages open storage Ceph technology. 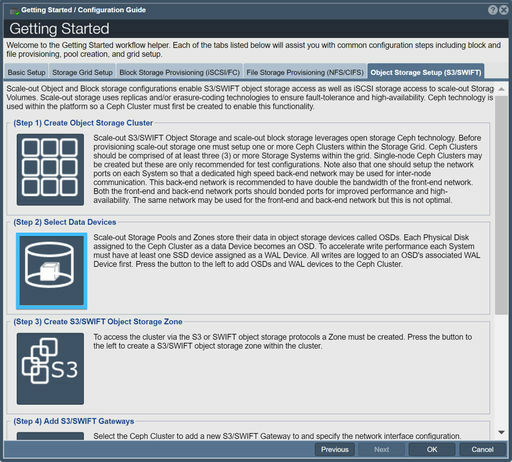 Before provisioning scale-out storage one must setup one or more Ceph Clusters within the Storage Grid. 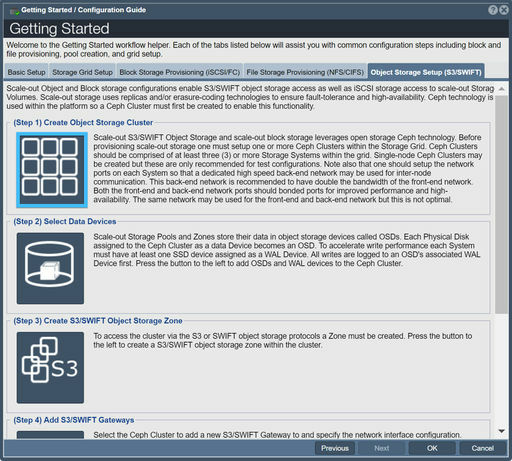 Ceph Clusters should be comprised of at least three (3) or more Storage Systems within the grid. Single-node Ceph Clusters may be created but these are only recommended for test configurations. Note also that one should setup the network ports on each System so that a dedicated high speed back-end network may be used for inter-node communication. This back-end network is recommended to have double the bandwidth of the front-end network. Both the front-end and back-end network ports should bonded ports for improved performance and high-availability. The same network may be used for the front-end and back-end network but this is not optimal. Scale-out Storage Pools and Zones store their data in object storage devices called OSDs. Each Physical Disk assigned to the Ceph Cluster as a data Device becomes an OSD. To accelerate write performance each System must have at least one SSD device assigned as a WAL Device. All writes are logged to an OSD's associated WAL Device first. Press the button to the left to add OSDs and WAL devices to the Ceph Cluster. 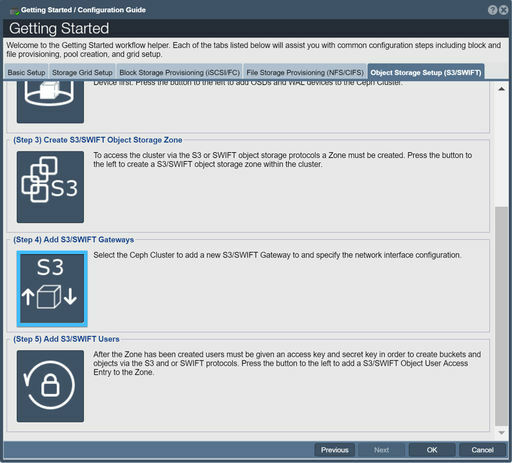 To access the cluster via the S3 or SWIFT object storage protocols a Zone must be created. Press the button to the left to create a S3/SWIFT object storage zone within the cluster. Select the Ceph Cluster to add a new S3/SWIFT Gateway to and specify the network interface configuration. After the Zone has been created users must be given an access key and secret key in order to create buckets and objects via the S3 and or SWIFT protocols. Press the button to the left to add a S3/SWIFT Object User Access Entry to the Zone.